This really lovely! So soft and warm. Your style is very comforting to look at! Nice job! What a lovely, sensitive drawing. Very nice. Ahh, don't you just want to be part of that hug too? I love the way you manage to convey so much atmosphere and emotion in a drawing! So sweet one, this one is a lovely work, really great! Sweet, soft, beautiful, positive and White Christmas! Oh, oh, oh! That is too wonderful! I love the way you've captured the bear's face. Nice job with the snowy colors! A W E S O M E !!!!!!!!! That's an awwwww if I ever saw one! This is just so ADORABLE! I just love the subtleness of it . . . awesome indeed!!!!! So magical! I love it. Amazing, the look on the kids face alone made me smile. Very nice penciling. Ops, sorry I have wrong! I was looking two blogs at the same time and I posted in the wrong one. Anyway, your illo is amazing! The face of the bear is fantastic and the color that you use is very nice. This is stunning! Love the color palette and the expressions! So sweat and cozy! Great work! Oh, do look at their expressions! This illo has to be my all time favorite...and, boy, that's saying something 'cos all your work is absolutely stellar! Outstanding. Just love everything about this. Your work is very special and I really admire your gentle, sensitive style. WOW, your illustrations are gorgeous! So soft :) Nice pencil technique!! Oh wow! I love this :) You are a wonderful artist. Oh! Kathy, I don't have words to describe the beauty of this image. I knew I was going to be wowed! I adore polar bears! Wonderful illustration and original concept! This is gorgeous! I love the white on white! absolutely wonderful illo! !So sensible soft colors and message! the soft colors you use really are wonderful and those paws, just wow! I absolutely LOVE this one! So darling. You are so talented! So soft and gentle and yet not insipid - really lovely. this is soooo beautiful. love how you have managed so much detail when it is all essentially white! Just re-read Phillip Pullmans ‘His Dark materials’ and this reminds me of Lyra and Iorek Byrnison (King of the Bears) who becomes one of her best friends. KAte this is GREAT, love all of it, color, texture, well all! I really love your wonderful style and technique! 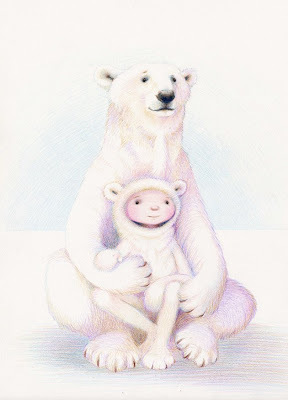 I guess no one has told the poor child that this wonderfully soft white bear is very dangerous indeed. he he he. This is just wonderful. I think I really like the shading here. The soft violet is very sweet. Great illustration. Your work is inspiring, sensitive and get a job so full of feelings and emotions, your very beautiful work, congratulations.